It is time for the ‘Volcano of Art‘ to get interactive and to get ‘telepathic‘. 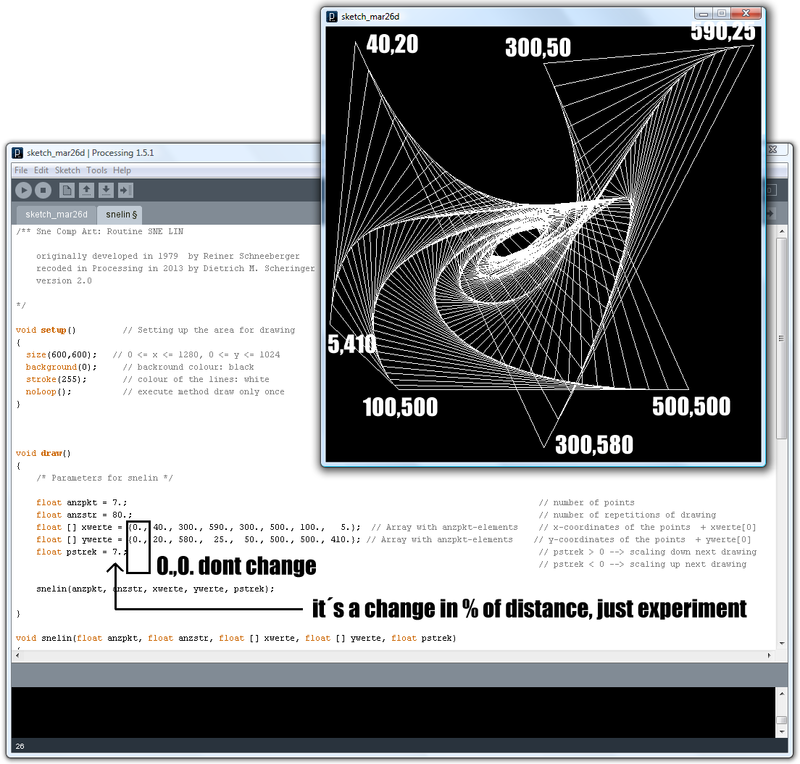 The interactive machine will be presented first at the FdL 2013 in two virtual worlds. Join a performance in the Metropolis Grid on October 18, 2013. 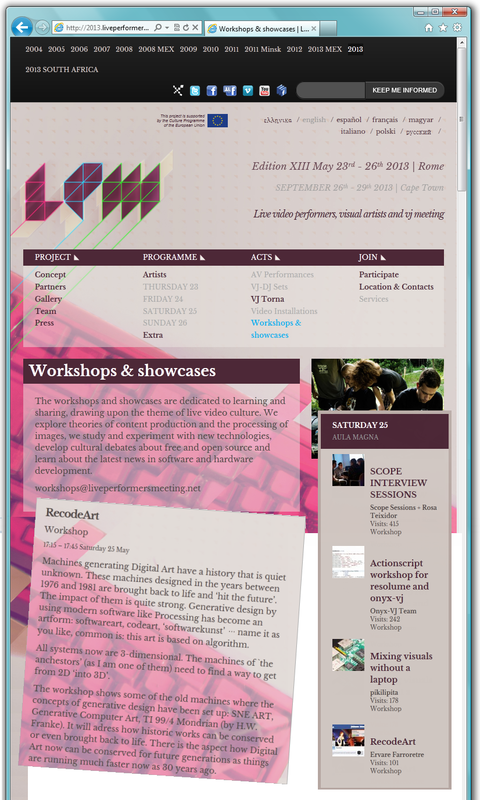 For ‘the live performers meeting’ LPM 2013 in Rome I uploaded in recodeproject.com a sketch of the routine SNEKAO using the artist name ROT-13 Ervare Farroretre. 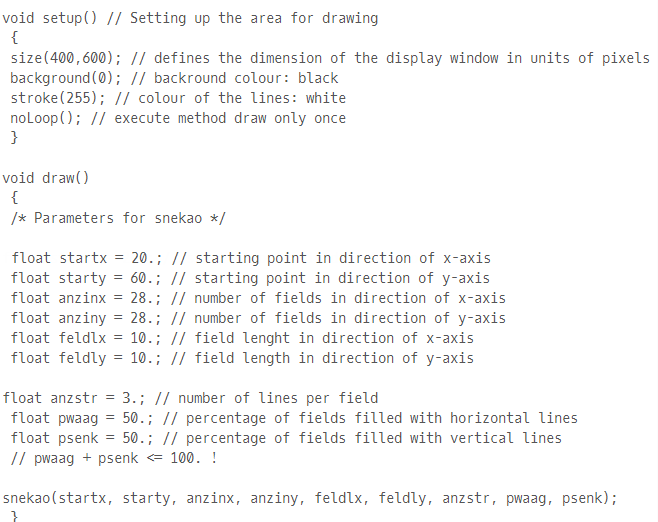 The sketch is a 100% recoding of the original routine SNEKAO programmed in FORTRAN in 1976-78. The recoding was done by Dietrich M. Scheringer. 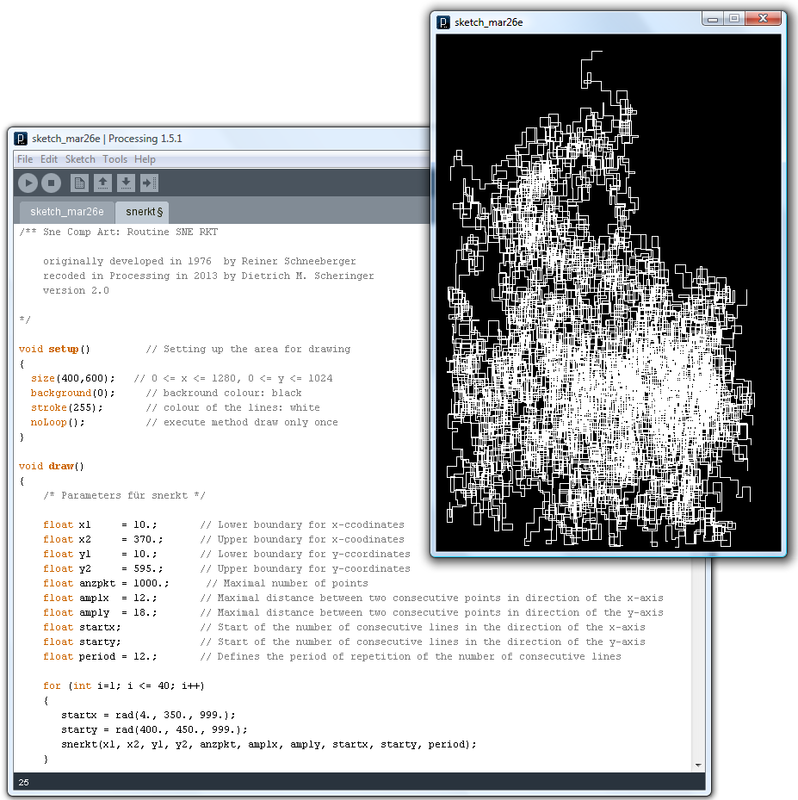 I will demonstrate live how one can just use this experimental code to do art. Step 1: go to recodeproject.com and search for Ervare Farroretre – or click on the link: Ervare. anzinx=28. / anziny=28. / feldx=10. / feldy=10. / anzstr=3. / pwaag=50. / psenk=50. Here you find a picture where you can see how the new settings of the paramters shall look. 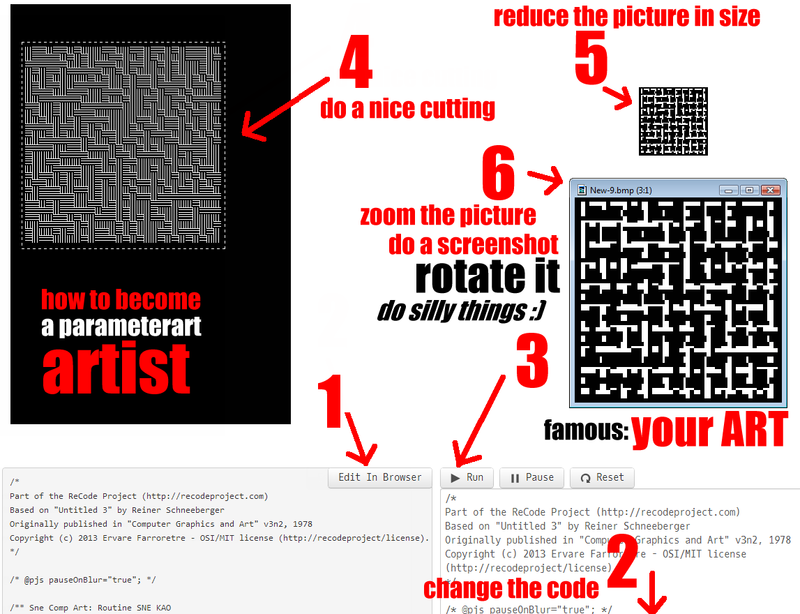 Step 3: Click on ‘Run’ so the code (sketch) is executed and enjoy the result. 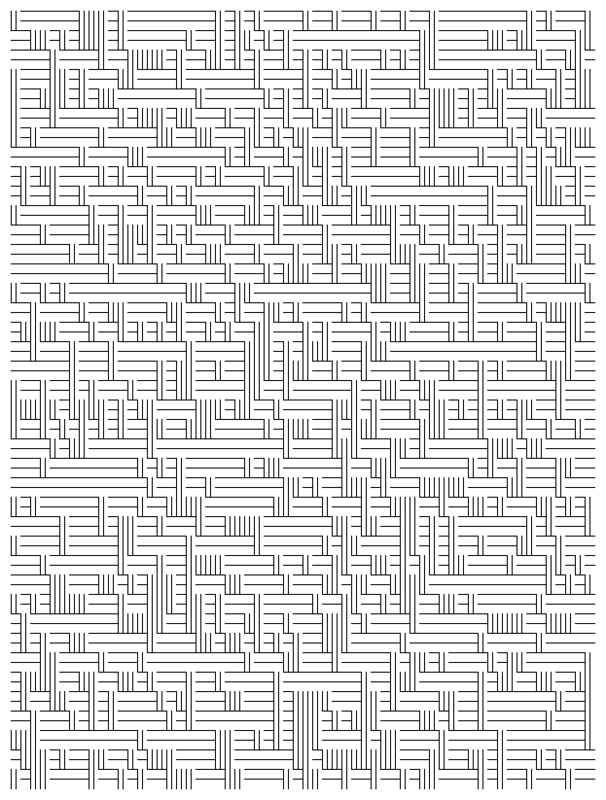 Hier ein Textauszug aus Programmierte Fälschungen Digitaler Kunst als Museumsprojekt? Software dreht schneller als alle Innovationen vor ihr und Softwarekunst wird schneller museal als jede Kunstform zuvor.